With summer upon us, we find ourselves and our families visiting the beach more often, whether it’s just down the street from where we live, or a destination spot for our latest vacation. As you pack your beach towels and blankets, snacks and life vests, remember to be aware of your surroundings, and to heed any warnings or indications of beach conditions during your time there. 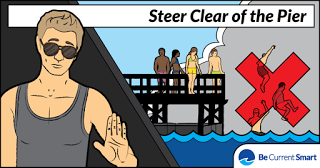 Rip currents can occur at any time, and the Great Lakes are not immune from their presence. Over the last few years, there have been more than 80 incidents involving rip currents (fatalities and rescues) on the Great Lakes, with most of these happening in Lake Michigan. It might not always be obvious where rip currents will appear, but the same cannot be said for a “structural current” (usually occurring around piers or breakwalls). 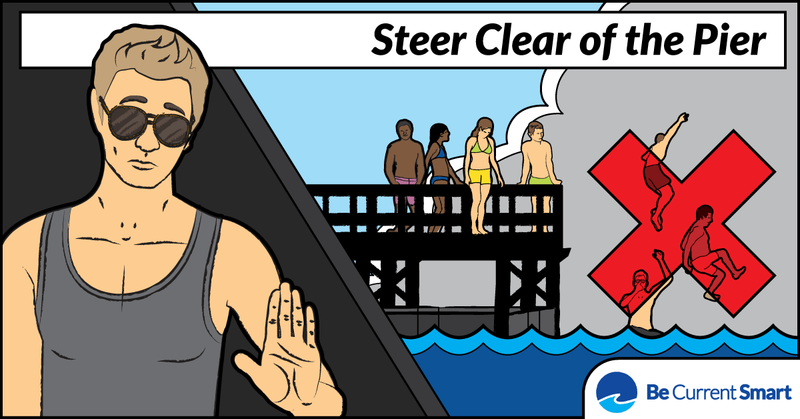 Today’s tip to help you be #currentsmart is a reminder to “Steer Clear of the Pier”. Please refrain from jumping off or swimming near these structures. Water safety is a responsibility we all share. To educate yourself more about rip currents on the Great Lakes, please check out dangerouscurrents.org. And if you’d like to share tips with your friends and loved ones? Check out currentsmart.org for easy-to-understand (and share!) animations and social media tools! Have a safe and happy summer, and remember to be current smart! Want to be part of our ongoing conversation? Find us on Twitter and Facebook.